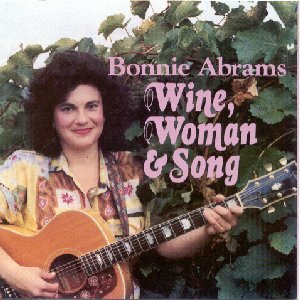 Winemaker by day and singer/songwriter every other moment, "Bonnie Abrams has a deep soulful voice and a passion for justice" says Dirty Linen. Bonnie's third album, Wine Woman & Song delivers Bonnie's versatile songwriting talents through her strong expressive voice, fine guitar playing, thoughtful liner notes, all the lyrics, guest musicians, and an additional photo. These songs embrace some lighthearted topics (Winemaker's Blues - what could possibly be bluesy about winemaking! ), they deliver cold thoughts on today's harsh realities (Only Americans - on the sabotage of Pan Am Flight 103), and take us to the heat of sun-drenched shores in Bahama Mama. Bonnie is a songwriter with extraordinary talents - her lyrics, whether cleverly subtle or right-to-the-point, demand listening and are never dull. Her talents have been honed in the festivals, coffee houses, and folk gatherings in Upstate New York, as well as the famous Kerrville Folk Festival. She is an award winning songwriter in the Music City and Billboard annual song contests, comfortable singing before a small gathering or festival crowd, and her every performance demonstrates the pure enjoyment of a real entertainer. Click here to find out more about Bonnie as a musician available to perform at a special occassion or event.